How long is a short video memoir? Most videos run about three minutes in duration. Some stories require longer durations and might work well as a progressive series of short episodes. It depends on the complexity and scope of the project. Call us for a customized quote. We’re good at offering a range of options. Can more than one person tell a story? Yes. It can be very effective to have two people play off each other in telling a story. How about oral history and audio recordings? Yes. Capturing stories as audio recordings is easy, fun and affordable. It’s a great way to get started with personal history. We offer this service. Do you interview people on camera? Yes, if you'd like. Telling your story on camera is a great option. We offer this service with careful lighting and planning to ensure success. Prices vary. We use royalty free music when possible. If you have something specific in mind, a music licensing fee will be presented to you as an option. Can you work with old family movies? Yes. Transferring footage from film to digital is a great option. Extra fees apply. Helping people document their life is important work. Your life matters and creating a short video in your own voice is an empowering creative experience. 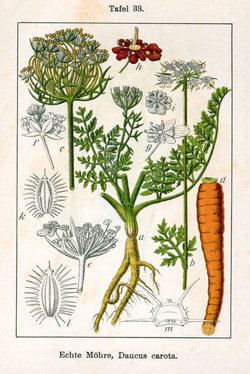 Why the name Wild Carrot? It's fun to say and easy to remember! Wild carrot is a tenacious wild flower with beautifully complex blossoms that radiate around a center, a metaphor for the cluster of stories that surround us. A single red or dark purple blossom is often found in the center of the array of small white flowers. Another name for wild carrot is Queen Anne's lace. Legend says the Queen was a skilled lace maker and the red flower in the center is a drop of her blood, a stain left when she pricked her finger while making lace.